The pancreas and the liver both have important roles in the digestion of food. When you eat, signals from your digestive tract activate both of these organs to secrete the substances needed to digest food. These chemicals must only be secreted when they are needed to avoid wasting the resources of both the liver and the pancreas. The pancreas produces a number of different special proteins known as enzymes. One of these enzymes, known as amylase, is needed to break down starch, which is also called amylose. 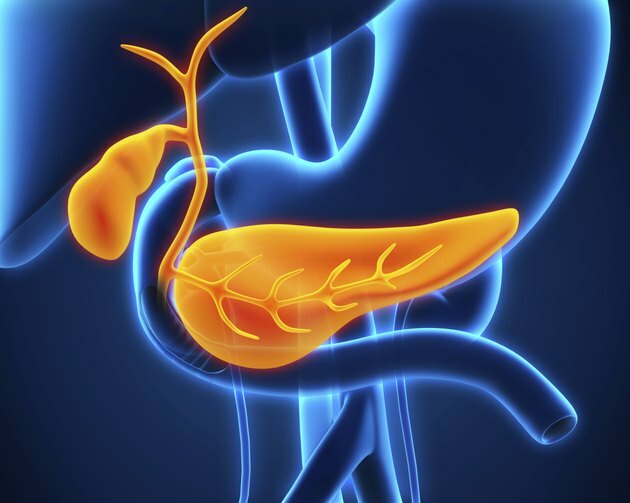 The pancreas also produces a number of different enzymes that break down proteins; these enzymes are activated by another enzyme known as pepsin. Finally, the pancreas secretes an enzyme known as lipase, which is needed to break down fats. Because the pancreas secretes so many enzymes, it is important that pancreatic juice only be secreted when there is food that needs to be digested. Three chemicals stimulate the pancreas: cholecystokinin, secretin and gastrin. Cholecystokinin is made by cells in the intestines when proteins and fats are detected in the digestive tract. These same cells also make another hormone, secretin, which stimulates the pancreas. Finally, gastrin, which is synthesized by cells in the stomach, also makes the pancreas release its digestive juices. Understanding what stimulates the secretion of bile requires you to understand bile's role in the digestive tract. Fats and oils do not mix well with water-based liquids, which includes the substances found in the digestive tract. This causes fat to form large globules, which prevents lipase from acting efficiently and also impairs intestinal absorption of fats. Bile breaks up these globules by serving as a bridge between water molecules and fat molecules. Bile is made by the liver and is stored in the gallbladder. When you consume fats, fatty acids in your intestines stimulate the secretion of cholecystokinin. This hormone makes the gallbladder contract and also relaxes a structure known as the Sphincter of Oddi, allowing bile to flow into the small intestines. When partially digested food is dumped into the small intestine, the leftover stomach acid triggers the production of secretin, which also activates the gallbladder. What Does Emulsify Fats Mean? What Is the Difference Between Bile Salts & Digestive Enzymes?